Cmde. 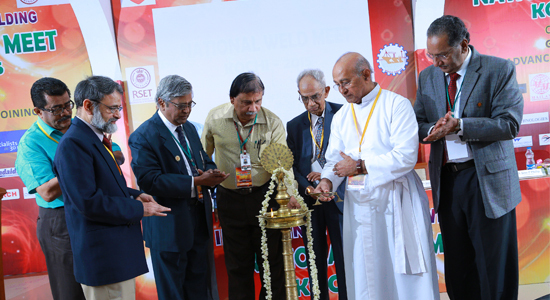 K. Subramaniam,C & MD,Cochin Shipyard Limitedinaugurated National Weld Meet: Kochi 2015 at Rajagiri School of Engineering and Technology on 9th October 2015. In his inaugural address, he spoke on the vast opportunities in the field of welding in ship building. He also raised his concern over shortage of skilled welding personnel in the field from the shop floor welders to the welding engineers and welding inspectors of the international standards. Welcome address was given by Dr. A. Unnikrishnan, Principal, RSET and Presidential address by Sri. R. Srinivasan,National President, IIW, Kolkata. P Govindankutty, Vice Chairman,IIW, Cochin gave the vote of thanks. Rev. Fr. Jose Alex CMI, Shri.Parimal Biswas, Shri. Jose P Philip, Dr. S Sunderesan also spoke on this occasion. One day seminar on GENERATION NEXT: ADVANCEMENT IN METAL JOINING was conducted as part of it. Distinguished speakers included Prof. Dr. S. Sundaresan, Formerly Professor IIT, Madras,Dr. Shaju K. Albert, Head, Materials Technology Division, IGCAR, Kalpakkam, Dr. A. Raja, Rtd. Addl. GM, WRI, Trichy& Visiting Faculty, AnnaUniversity, Mr. P. Arunkumar, Head, Spacecraft Propulsion Engineer, Division, ISRO, Trivandrum, Mr. Dave De Groot, Chief Technology, HGG Profiling Equipment B.V, Netherlands, Mr. RashmiRanjanMohapatra, Managing Director, Kemppi India, Mr. CathaldoSposato, International Sales Director, LORCH, Schweisstechnik, GmbH, Germany. An MOU was also signed between RSET and IIW India which facilitates the sharing of facilities and expertise for improving the capabilities for advanced education and research in Welding technology & related fields of activities. It will also help the students to gain knowledge and get expert guidance through various activities like seminars, workshops and technical conferences which will be organised by IIW. It will also help the institution to set up world-class laboratories with the help of experts in the respective fields.